Normally i don’t make a habit of listing how many pots and pans you need to make a recipe, but since you really need a lot of equipment for this one, here goes: 2 pans, a measuring cup, a small ovenproof bowl, a bowl, a cutting board, a whisk, a knife, a tabelspoon, an electric hand mixer and a spatula. Whip the cream stiff and put it in the refrigerator. Cut the chocolate in pieces so that it melts easy. 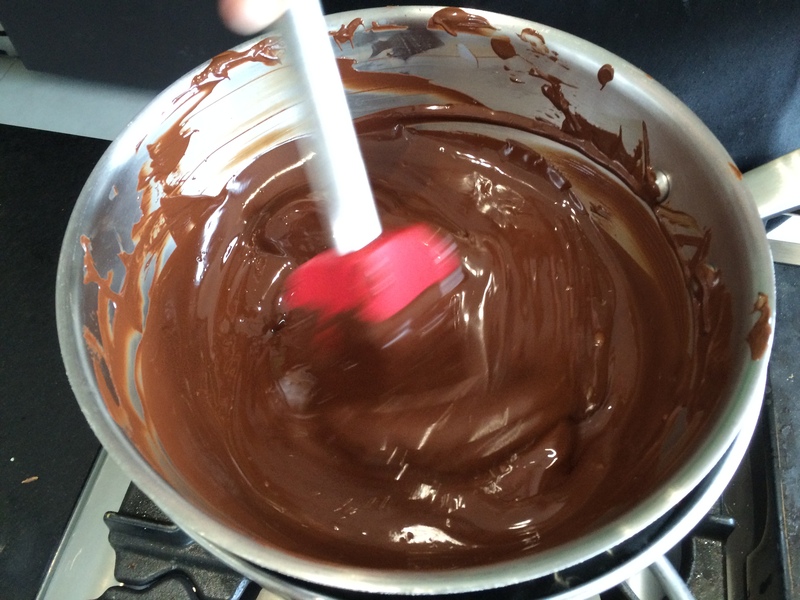 Put the chocolate pieces in the smaller pan and melt using a bain-marie (water bath). The water should never reach the boiling point. 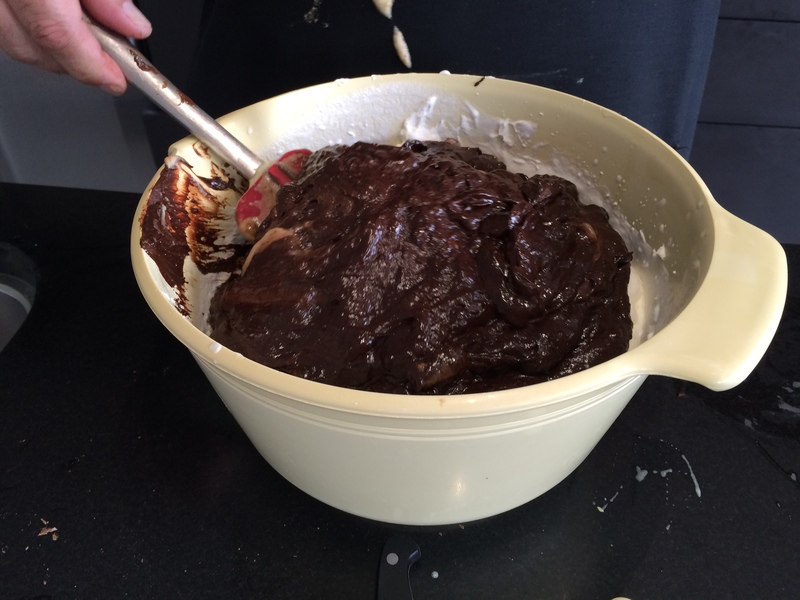 Once the chocolate is melted, now put a bowl with the 2 eggs and rum in the water bath and whip the mixture using the mixer. 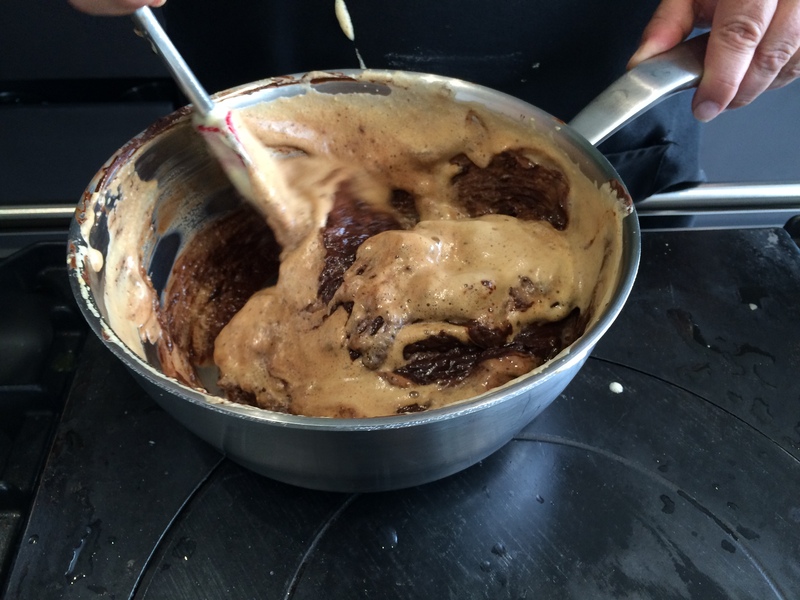 Poor the chocolate together with the whipped foamy egg mixture. 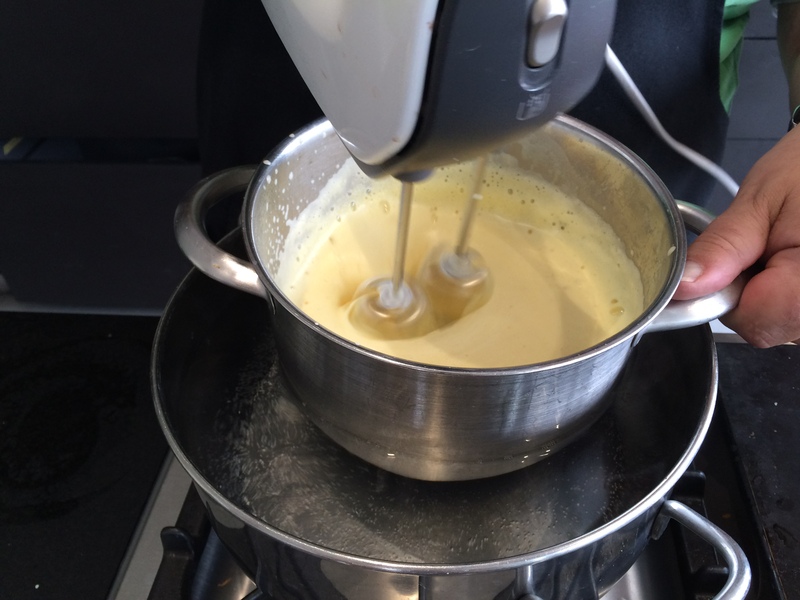 Stir gently using a whisk or a spatula until you get one smooth mixture. 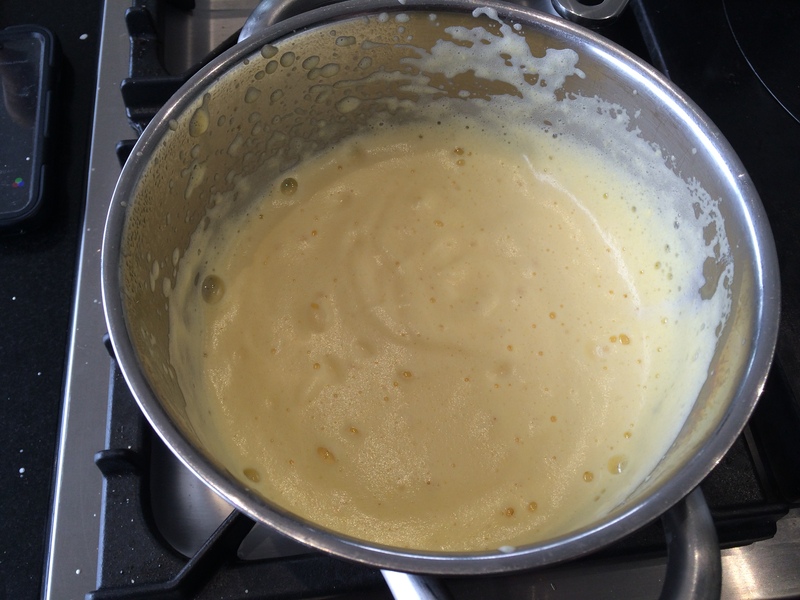 Now poor this mixture with the whipped cream and stir gently until you get an even mousse. Be gentle so you don’t ‘break’ the fluffyness of the mixture. 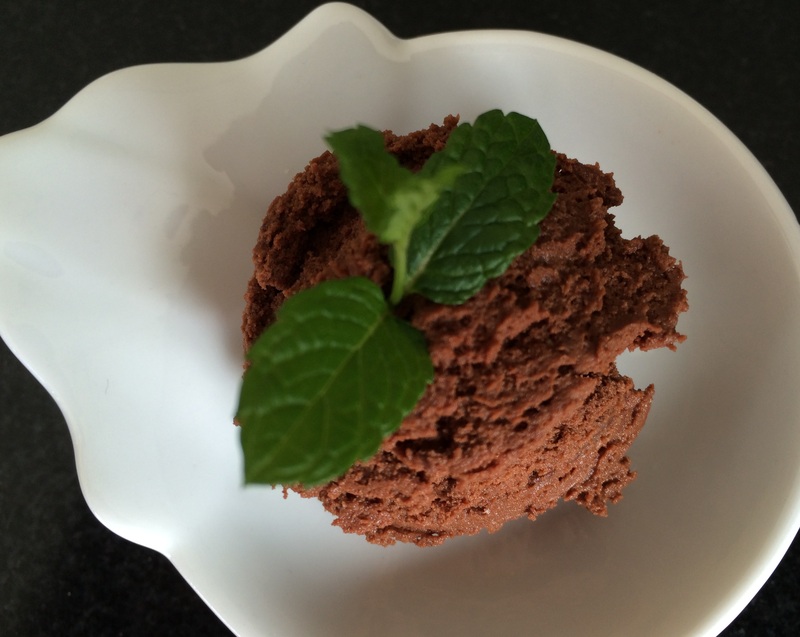 If you wish you can poor the mousse in one serving bowl or in different smaller ones, depending how you plan to serve. Cool the mousse in the fridge. The main secret of good chocolat mousse is good chocolate. 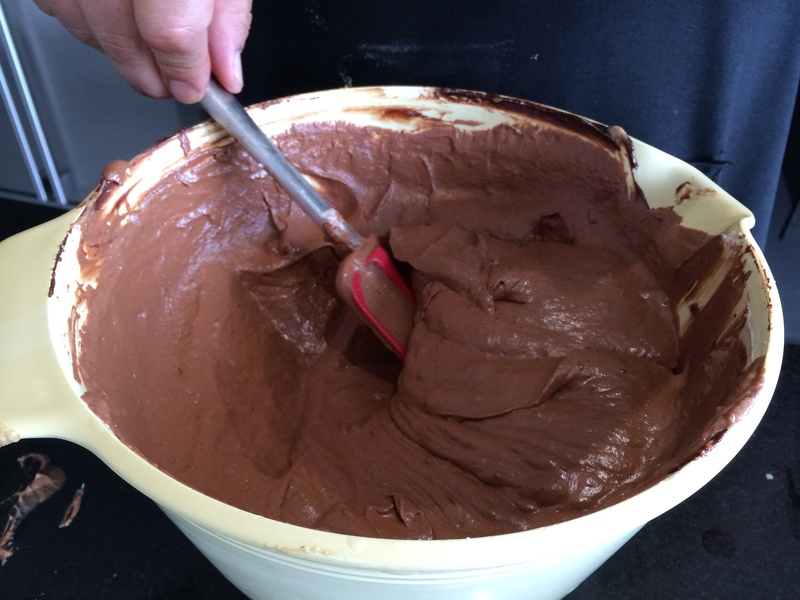 We allways buy pure Callebaut chocolate, nothing beats a mousse with that base. But you can use milk chocolate if you rather fancy a slightly less outspoken taste. You will find that the mousse really stiffens very well. So the mousse can easily be served using an ice cream scoop, potentially as part of a dessert plate. You can make it a really small or a really big treat. If you read the recipe and think its a lot of work and a lot of washing up… it’s worthet. This entry was posted in Belgian Classics, Deserts and tagged Belgium, Calebaut, chocolate, mousse, treat by petratant. Bookmark the permalink.